A molecular machine with a rotary motor builds a long protein filament involved in bacterial motility and attachment. The type IVa pilus machine. Portions of the collar embedded in the outer membrane are not included in the coordinate set and are shown schematically here. Bacteria live in complex ecologies, filled with competitors, environmental dangers, and defensive hosts. They face these challenges in many ways: by gathering together into tough biofilm communities, by sharing genetic information encoding useful proteins, and by picking up and moving when things look better elsewhere. Pili play an important role in all of these responses. Pili are long, thin protein filaments that help bacteria adhere to their local environment. They come in many shapes and sizes, and are deployed from the cell surface by complex assembly machines. The molecular machine shown here, from PDB entry 3jc8, builds one of most widespread forms of pili, termed a type IVa pilus. The pilus is extended from the center of the machine, often to lengths that rival the size of the cell. 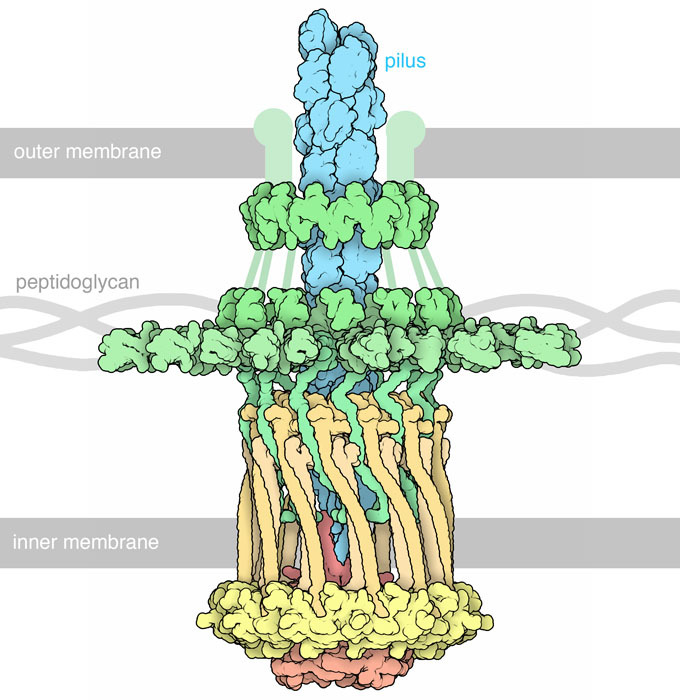 The machine spans the entire cell wall: a rotary motor embedded in the cytoplasmic membrane adds new subunits, a collar guides the growing pilus through the outer membrane, and a ring of proteins anchors the whole thing to the peptidoglycan layer that fills the space between the two membranes. The structure was modeled by fitting atomic structures of the individual proteins into a cryo-EM tomograph (EMD-3247) that shows overall morphology. This pilus machine is built by a predatory soil bacterium that forms swarms of cells that search for bacterial prey. These cells use the pilus machine like a grappling hook to crawl, by extending a pilus, attaching it to a surface, then reeling it back in. Since it requires a lot of force to drag the entire cell, these assembly machines are among the most powerful molecular motors known. Close-up on the rotary motor of the pilus machine. The motor is thought to control whether the pilus is being extended or contracted at any moment. Individual pilin subunits are embedded in the membrane. 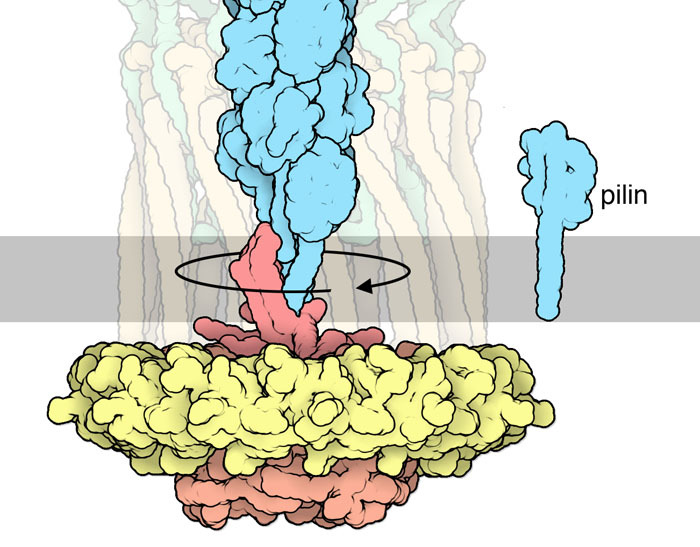 A small asymmetric protein in the motor, termed PilC (colored red in the illustrations), has a cavity on one side that cups the end of the filament. Researchers have proposed that as the motor turns, PilC forces the filament up, opening space for a new pilin subunit to associate. To shorten the filament, the motor appears to switch direction, popping pilin subunits one at a time back into the membrane. The pilin subunit has a distinctive structure. 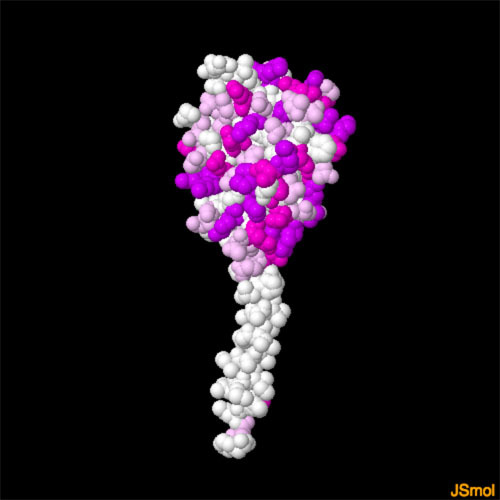 It has a globular head that is covered with charged, water-soluble amino acids (shown here in magenta), and a long alpha-helical tail that is mostly hydrophobic (shown in white). The hydrophobic tail plays two roles: it embeds the individual pilin subunits into the bacterial membrane, and it forms a tight bundle with other pilin subunits to stabilize the filament. To explore of pilin and the filament (PDB entry 2hil) in more detail, click on the image for an interactive JSmol. A structural model was also obtained for an empty form of the machine, before it starts construction of the pilus. You can view it in PDB entry 3jc9. Structures for many other types of pili are available in the PDB archive—try searching for “pilus” to find them. MK Hospenthal, TRD Costa & G Waksman (2017) A comprehensive guide to pilus biogenesis in gram-negative bacteria. Nature Reviews Microbiology 15, 365-379. M McCallum, S Tammam, A Khan, LL Burrows & PL Howell (2017) The molecular mechanism of the type IVa pilus motors. Nature Communications 8, 15091. 3jc8: YW Chang, LA Rettberg, A Treuner-Lange, J Iwasa, L Sogaard-Andersen & GJ Jensen (2016) Architecture of the type IVa pilus machine. Science 351, aad2001. 2hil: L Craig, N Volkmann, AS Arvai, ME Pique, M Yeager, EH Egelman & JA Tainer (2006) Type IV pilus structure by cryo-electron microscopy and crystallography: implications for pilus assembly and functions. Molecular Cell 23, 651-662.